As far as I’m concerned, part of the fun of BEA is the planning and the anticipation. And the planning I’ve doing! I’ve been pouring over the PW “Galleys to Grab” article, Barbara Hoffert’s “Galley and Signing Guide,” as well as the BEA website and the mobile app. So much potential for enjoyment here! I can’t believe I’ve only got two days before the train leaves the station! 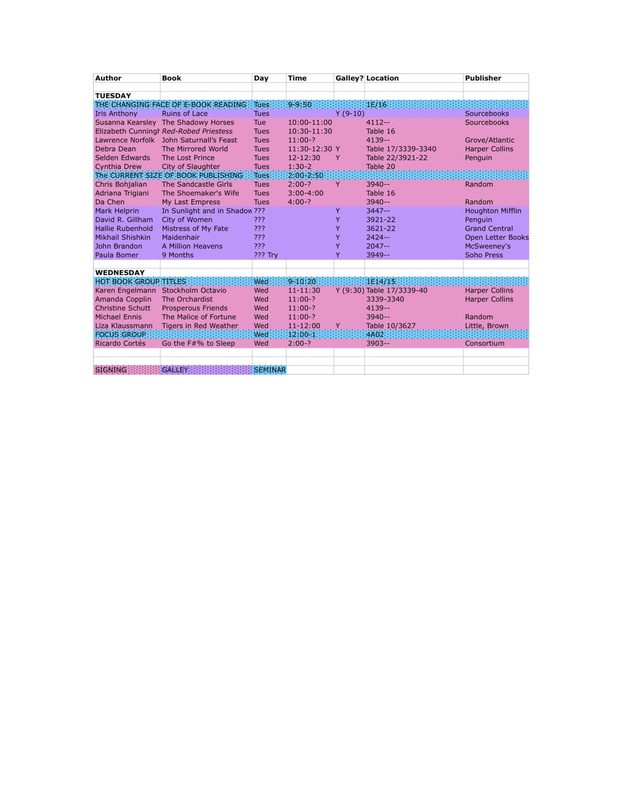 So, this is my obsessive-compulsive personality’s spreadsheet of the “must do” events at BEA this year (it doesn’t include Blogger Con, but that’s a different creature altogether). I’m wearing three hats this year: as a representative of the press, a representative of the HNS, and for my personal blog. I will be prowling the academic presses and military-political-focused publishers for work contacts, the mainstream presses for historical novels, and although this event is geared around the mainstream publishing world, there are always some small presses and independent authors at BEA, so I intend to seek them out for this blog. I’ll review enticing mainstream HF here as well. I’m hoping to return with knowledge of how to make this blog better, more contacts and book sources, and updates on the latest trends in paper and e-book publishing. Of course, I will share what I learn here, and I will make sure to post photos and updates from the convention. I am currently reading Julie K. Rose’s lovely work, Oleanna, which will accompany me on the train; hopefully I can finish it and write the HNS review on the ride home. Then I will begin book two of Sam Baty’s WW2 thriller series, Darkness into Light. Thank you again for all of the review requests–I intend to catch up on correspondence over the weekend.